Tsugaike Apartment is a modern Ski-in Ski-out 2 Bedroom Apartment at Tsugaike Ski Resort in the Hakuba Valley, boasting stunning panoramic views of the Japanese Alps. Sleeping up to 4 guests, this comfortable and stylish apartment offers a prime location at one of the Hakuba Valley's largest and best ski resorts. Enjoy the convenience of a prime ski-in ski-out location at one of the Hakuba Valley’s biggest and best ski resorts - Tsugaike Kogen. This modern 2 bedroom apartment sleeps 4 guests and offers stylish and comfortable accommodation just 1 minute walk from the edge of the Tsugaike ski slopes. Whether you are dreaming of first tracks each morning, or a property offering the ultimate convenient location for your afternoon ski break, Tsugaike Apartment’s exceptional location ensures your Japan ski holiday experience will be effortless and memorable. Featuring large south & east facing windows, this bright 3rd floor apartment sits at 910m, offering spectacular panoramic views overlooking the Tsugaike slopes, Hakuba Valley and magnificent Japanese Alps mountain range. It’s not uncommon to wake up to awe-inspiring snowy alpine views, looking down over a sea of clouds in the valley below! Located in a tranquil setting, you can relax and unwind after a day on the Hakuba slopes, soaking up the stunning mountain views from this cosy alpine retreat. 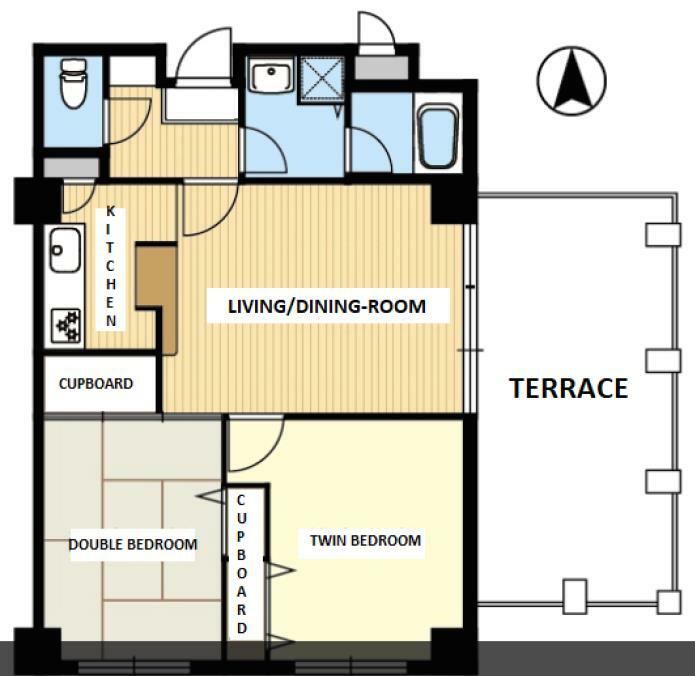 At Tsugaike Apartment you can enjoy modern interiors and contemporary amenities including full kitchen, open-plan living and dining area, large 55” TV with Netflix, WIFI and bluetooth sound bar. Secure ski storage, drying area, washing machine and guest parking complete this well equipped property, to provide a convenient home away from home experience in the mountains. Sit back, relax and enjoy the alpine ambience of this well thought out apartment. With the ski slopes, restaurants, bars and local onsen hot springs and other amenities literally on your doorstep, Tsugaike Apartment offers an ideal location for families and groups of friends. Enjoy exploring the authentic Japanese village area in the evening and escape the crowds. Complimentary supermarket shuttles are provided too. Nestled at the edge of Hakuba’s Tsugaike slopes, Tsugaike Apartment offers the perfect location for those looking for a ski-in ski-out experience, which is so rare in the Hakuba Valley. Simply walk across the street from the apartment and onto the gentle lower slopes and ski down to the gondola and other lifts. A true favourite with the Japanese, Tsugaike Kogen ski resort is one of the largest resorts in the Hakuba Valley. With quiet slopes, no lift lines or crowds, Tsugaike offers outstanding skiing and snowboarding suitable for every level. At the base of the mountain are some of Japan’s most expansive and arguably best beginner slopes. At 1.2km wide, you won’t have to venture far to find a quiet spot to learn. Group & private ski/snowboard lessons are available in English too. This is undoubtedly the best area for beginners in the Hakuba Valley, with perfect terrain for families with young children seeking uncrowded slopes. Intermediates can enjoy Tsugaike’s fantastic variety of immaculately groomed long runs with spectacular alpine views of the Japanese Alps. Take the gondola all the way to the top (it’s a 20 minute ride!) and cruise down the empty slopes. Dreaming of bottomless powder? You’ve come to the right place! The Tsugapow double black diamond area offers vast off-piste tree skiing terrain for advanced riders seeking Japan’s famous powder, of which there is a plentiful supply at the northern end of the Hakuba Valley. Beyond the resort boundary lies access to Hakuba’s best ski touring terrain for backcountry enthusiasts. Tsugaike also has extensive night skiing slopes, for those who didn’t get enough in the daytime. Tsugaike Apartment also provides the ideal spot from which to access neighbouring Hakuba Valley resorts. Norikura and Cortina Resorts, famous for their deep powder and off-piste terrain, are just a 5 minute shuttle ride away. Enjoy spectacular panoramic views of the Hakuba Valley and check out the brand-new Mountain Harbor terrace and cafe at Iwatake Resort, just 10 minutes away on the shuttle. Tsugaike is well connected by both daytime and evening shuttles to the rest of the valley, should you wish to venture further afield and explore everything Hakuba has to offer. Escape the hustle and bustle of other areas in Hakuba, to experience a slice of traditional Japan in Tsugaike. After a day exploring Tsugaike’s extensive slopes, enjoy the local village onsens, bars and restaurants, which are all right on the doorstep. Must book 5 nights or more.